Published Aug 13, 2013 by Addison-Wesley Professional. Part of the LiveLessons series. Lesson 1, "What's New in Objective-C and iOS 6", focuses on new features available in iOS 6, the Accounts and Social frameworks, enhancements and updates to the Accessibility framework, changes and improvements in UIKit, and what's new in Storyboards. Finally, viewers are taught about subscripting in Objective-C as well as enhancements and updates made to the language. Lesson 2 , "Setup and Installation", guides viewers through the process of creating an Apple Developer Account and Enrolling in the iOS Developer Program. The video also covers the features and resources available in the iOS Developer Portal, and downloading and Installing Xcode. Lesson 2 finishes by teaching viewers about provisioning profiles and certificates. Lesson 3 , "Getting to Know Xcode and Interface Builder", discusses Xcode and Interface Builder, shows how to customize Xcode, download additional installs, and how to use the Organizer. Finally, viewers are taught how to work with Schemes and project settings inside Xcode. Lesson 4 , "Common Design Patterns", covers the concepts behind software development design patterns. The video teaches viewers about the model-view-controller pattern, the observer pattern, the adapter pattern and finishes with a discussion about other common patterns used when writing and developing software. Lesson 5, "Creating the UI in Interface Builder", teaches viewers how to work within Interface Builder. They also learn the difference between working NIBs and working with Storyboards, using Springs and Struts versus Autolayout and, finally, create the iPhone storyboard for the iDo iOS app. Lesson 6, "Programming the UI", covers the creation of UIViewController and UITableViewCell subclasses, and how to add interactivity and functionality to the iDo App. Lesson 6 finishes by adding sample data so the iDo app can be tested. Lesson 7, "Understanding Core Data", covers the concepts and theory behind Core Data. Viewers are taught about the Core Data Stack, the available store types when using Core Data on iOS, and how to use the NSFetchedResultsController to seamlessly connect table views with a Core Data store. Finally, they are taught how to create a Core Data demo app. Lesson 8, "Creating the Core Data Stack", guides viewers through the process of creating the Core Data Stack from the ground up. They are also taught how to create the data model file and NSManagedObject subclasses for the entities inside the data model. Finally, viewers begin adding the NSFetchedResultsController to iDo. Lesson 9, "Connecting Core Data to the UI", finishes the process of implementing the NSFetchedResultsController. The video also shows how to add pull-to-refresh functionality via the UIRefreshControl component. Lesson 9 finishes by showing additional tips and adding polish to the existing Core Data functionality. Lesson 10, "UIKit Customization", covers the UIKit framework hierarchy and focuses on Proxy objects. Viewers are guided through the process of customizing the UI and look of iDo, adding app icons, default images and support for Retina Display devices. Lesson 11, "Adding Social and Sharing Features", discusses the Accounts and Social Frameworks. The video shows the process of adding social functionality to iDo so users may share about the app via Twitter, Facebook, email and SMS. Finally, the video teaches what Activity Views are and how they help add additional functionality to any app. Lesson 12, "Making iDo Accessible", guides viewers through the process of adding Accessibility support. The Accessibility framework helps developers make their apps accessible to users with disabilities. By the end of the lesson, the viewer will have added full support for VoiceOver, Apple's screen-reading technology available on iOS. Lesson 13, "Working with Grand Central Dispatch", teaches how to make code run concurrently by using Grand Central Dispatch. The video covers the theory and concepts behind GCD, how to work with queues and groups, and finishes by guiding viewers through the process of creating a demo iOS app that uses GCD to asynchronously download data from Twitter. Lesson 14, "Creating iDo for iPad", covers the unique iOS features available for iPad devices. The video focuses on the creation of the iPad storyboard for iDo and how to get started with iDo's iPad-specific subclasses. Lesson 15, "Finalizing the iDo iPad Version", finishes the iPad-specific subclasses for iDo. Viewers also refactor code and test the app to make sure everything works on iPad. Finally, they are taught how to customize the iPad UI so it looks like the iPhone version of iDo. Lesson 16, "Submitting Your App to iTunes Connect", teaches viewers about the features and services available in iTunes Connect. The video also covers how to create the iDo App in iTunes Connect, the certificates required to build iDo for the App Store, how to verify schemes in Xcode and how to build iDo for iTunes Connect submission. Finally, they are shown how to upload the application binary to iTunes Connect for review, approval and distribution through the iTunes App Store. 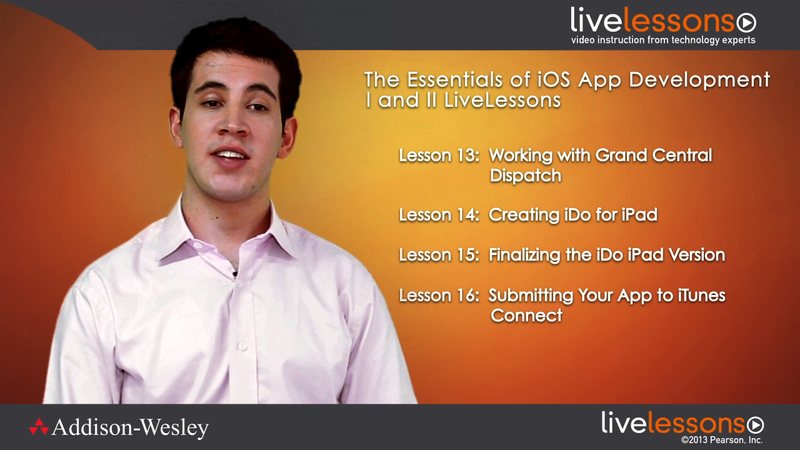 The Essentials of iOS Development LiveLessons is the definitive complete video training course on the basics of iOS programming and how to build a basic iOS application. Felipe Laso Marsetti, an iOS developer and contributor of iOS tutorials at raywenderlich.com, provides the novice programmer with 16 hours of hands-on step-by-step video training on how to build an iOS application. Laso Marsetti shows you how to build iDo, a basic task management application; you'll start with the basics and learn how to build this application for the iPhone and iPad at your own pace. The course does not assume any previous programming experience and shows you everything from how to navigate the xCode interface to creating the user interface, working with Core Data, adding social features, making the app accessible, and much more.